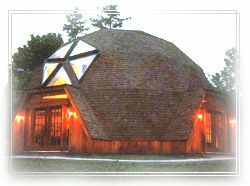 According to Dr. Buckminster Fuller's theory of Geodesic Dome Construction, we invent this excellent dome tent for the huge market. 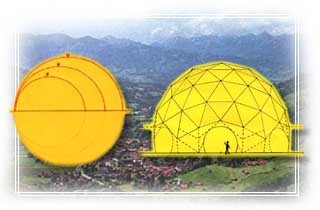 Everybody, both child and adult can easily setup and break-down this dome tent in ten ( 10 ) minutes by hands only, no need any tools. The structure ( aluminium pipe ) is pre-cut, pre-bend, pre-drilled hole and pre-code color by Computer Aid Design ( CAD ). It is precise and superior in quality. A very good design both for Air and View. One Door, Two Windows and two Ventilations. 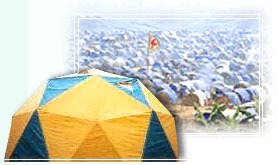 This is the most strong, beautiful, durable and the biggest volume space tent in the world now. 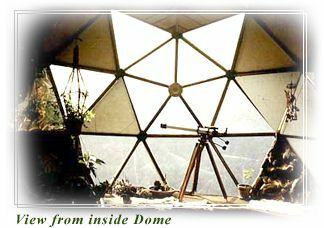 It may be both a beautiful camping tent and a warm dome home for many peoples. 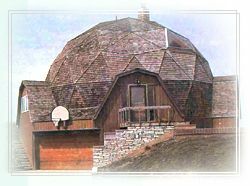 Our Famous Brand : KING DOME. Diameter : 3.5 meters for 1-4 persons. Bottom : 9.60 Square Meters. Surface : 19.20 Square Meters. Space ( Volume ) : 11.23 Cubic Meters. 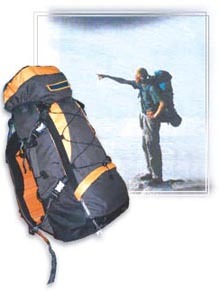 Diameter : 4.5 meters for 4-7 persons. Bottom : 15.90 Square Meters. Surface : 31.80 Square Meters. Space ( Volume ) : 23.86 Cubic Meters. Diameter : 5.5 meters for 7-10 persons. Bottom : 23.76 Square Meters. Surface : 47.52 Square Meters. Space ( volume ) : 43.56 Cubic Meters. A considerate and comfortable design. As same as a part of your body. Big volume, easy carry with. Size: 70 cm X 35 cm X 25 cm.